The social, educational and political writings of Jean-Jacques Rousseau have become enormously influential in the 200 years since his death. But the breadth as well as the depth of Rousseau's achievement - he was amongst other things a creative writer and musical composer as well as a philosopher - is not always appreciated. In around 100 articles, alphabetically arranged and fully cross-referenced, N. J. H. Dent explores all facets of Rousseau's work and thoughts, while his subject's remarkable life is summarized in a biographical introduction. Details of works by and about Rousseau are listed in an extensive bibliography. 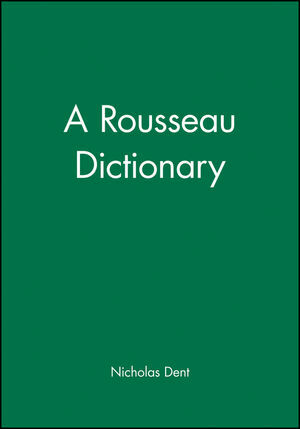 For students or general readers seeking an introduction to Rousseau's work, and for those already familiar with the material who require a convenient reference source, this dictionary is essential reading. N. J. H. Dent is Lecturer in Philosophy at the University of Birmingham. His previous publication include a monographic study, Rousseau (Blackwell, 1988).